A versatile performer. Samsung has extended its popular 5 Series with a new well-rounded notebook. The 15-inch 510R5E aims to appeal to customers with a slim case and up-to-date mid-range hardware components. AMD's freshly released Radeon HD 8750M promises a high level of performance, while at the same time using a moderate amount of power. The question is whether the two kilogram lightweight is able to live up to expectations. According to Samsung the 5 Series includes well-rounded notebooks that are compact and light, but also have potent processing power. The model for review was the 800 Euro (~$1050) 510R5E S01DE, a Germany special that certainly fulfills these characteristics. Inside the 15-inch case is a potent dual-core processor from Intel's Ivy Bridge series (Core i5-3210M) and an energy efficient 22 nm iGPU at work. The DirectX 11.1 capable AMD Radeon HD 8750M is striving to find the perfect compromise between speed, heat dissipation and power consumption. To remove any memory oriented performance bottle-necks, Samsung has included two DDR3 RAM modules with a capacity of 4096 MB each. The hard drive bay meanwhile contains a 1000 GB HDD and the matte display has a resolution of 1366 x 768 pixels. It is not surprising to find the latest Windows 8 64 bit operating system on the laptop. Altogether, the specifications indicate a well-rounded system. Our review will determine the strengths and weaknesses of the mobile device. When it comes to the case, the manufacturer hasn't made any glaring mistakes. Samsung has skillfully combined both plastic (display bezel, keyboard surroundings, base) and metal (palm rest, lid). With the exception of the jet black bottom of the 15-inch notebook, the remaining surfaces are covered with a refreshing silver-grey color. We would also describe the shape and size to be pleasing to the user. The multimedia device makes a classy and at the same time simplistic impression. Thanks to the matte surfaces, the notebook doesn't stand out as a dust-magnet which is usually the case with glossy devices (e.g. Toshiba Satellite L850). The manufacturing quality of our reviewed device was up to a good standard. For those that are not especially demanding, the level of quality should definitely be sufficient. We weren't quite as content when it came to the stability though. Depending on the amount of pressure exerted, the keyboard and touchpad dent inwards considerably in some cases, and the lid could also be a bit more firm, although these shortcomings shouldn't stand out negatively during normal daily use. The slim case (23 millimeters high) and the light weight (approximately two kilograms) allow the machine with a good level of mobility. A few more words regarding the opening mechanism: Samsung have set both of the hinges in such a way that opening the display requires both hands. Despite the relatively rigid mechanical components, the display still wobbles when the base is moved even slightly. The connectivity options certainly won't knock anyone's socks off. Although the 510R5E is able to make some headway with a fast USB 3.0 port, the combined audio socket (3.5 mm mini-jack for headphones/speakers or a microphone) and a total of three USB ports are the norm for this class of device. Despite the fact that the height of the base unit doesn't exceed two centimeters, Samsung has still included a full-fledged RJ-45 Gigabit Ethernet port, and a normal VGA port. Other slim notebooks such as the Samsung 770Z7E and the Asus U38DT require adapters (in the case of the VGA port) or moving parts (Ethernet port) to enable their use. An HDMI port, Kensington Lock slot and a card reader (SD, SDHC, SDXC) are of course also all on board. Since Samsung has integrated the interfaces into the rear of the case, there should still be enough space around the sides of the notebook for a mouse even when several cables are attached. The webcam integrated into the top of the display bezel supports 720p according to the manufacturer. It is a shame that there is no optical drive included. The wireless module is a Centrino Advanced-N 6235. 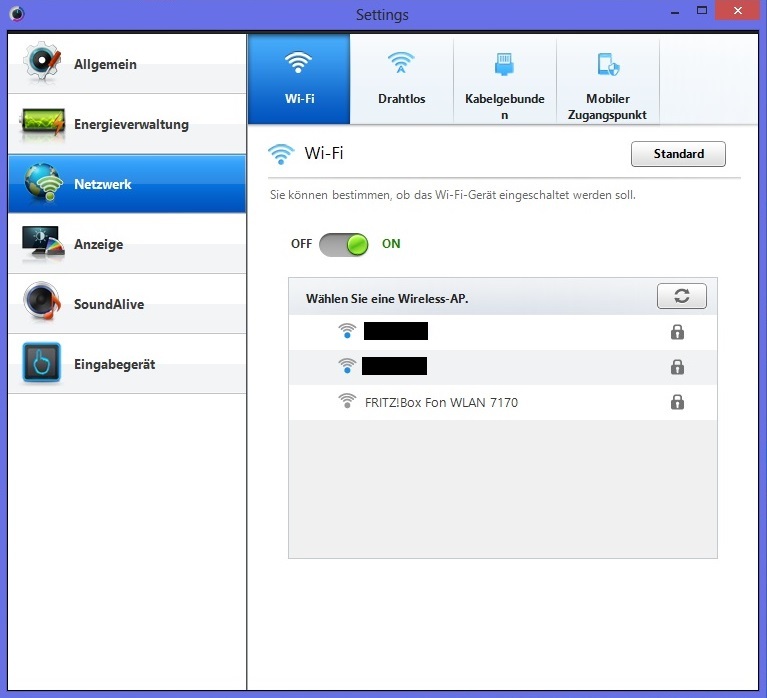 The nodule supports the WLAN standards 802.11 a/b/g/n (2.4 & 5.0 GHz, max. 300 Mbps) and Bluetooth 4.0. The technologies Wireless Display, Smart Connect and VPro should be more interesting for advanced users. The features offered on the Intel chip are expected for such type of hardware. The maintenance options should suffice for the average user. After removing the maintenance panel on the bottom of the base unit (slides off towards the front), users can reach the 2.5 inch hard drive bay and the two DDR3 RAM slots. The HDD is beneath a metal cover and the RAM is directly accessible. Changing of the components shouldn't pose a problem for the layman either. The upgrade to a Solid State Drive would be worthwhile. Anyone interested in gaining access to the cooling fan, CPU, or GPU (presumably soldered to the mainboard), will have to take the whole case apart though. 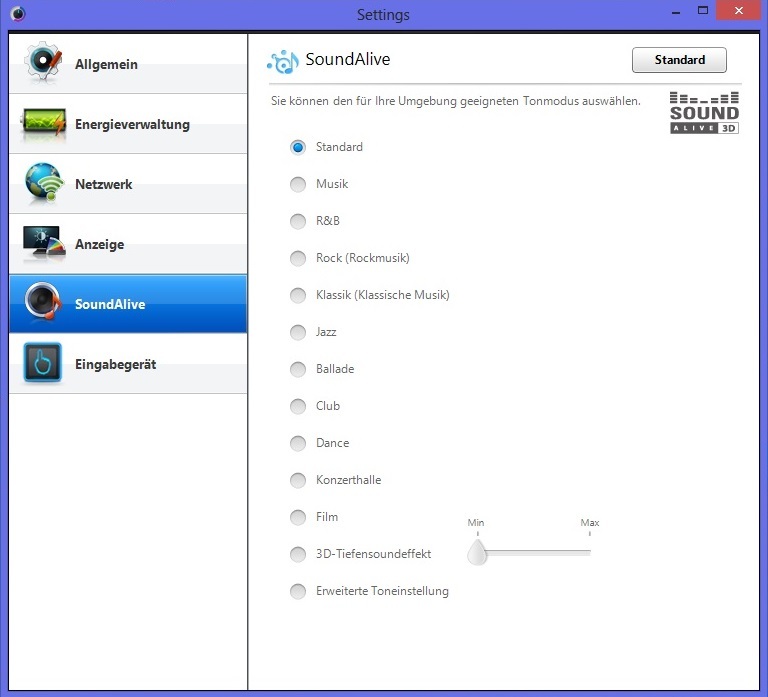 As shown in the screen shot on the right, the manufacturer has pre-installed quite an array of software. Many buyers would be pleasantly surprised to find "Adobe Photoshop Elements 11 and "Cyberlink PowerDVD 10". Thanks to "Adobe Reader X" and the trial version of "Microsoft Office", there shouldn't be problems opening various documents on the laptop on first boot. We particularly liked the "Settings" software from Samsung. 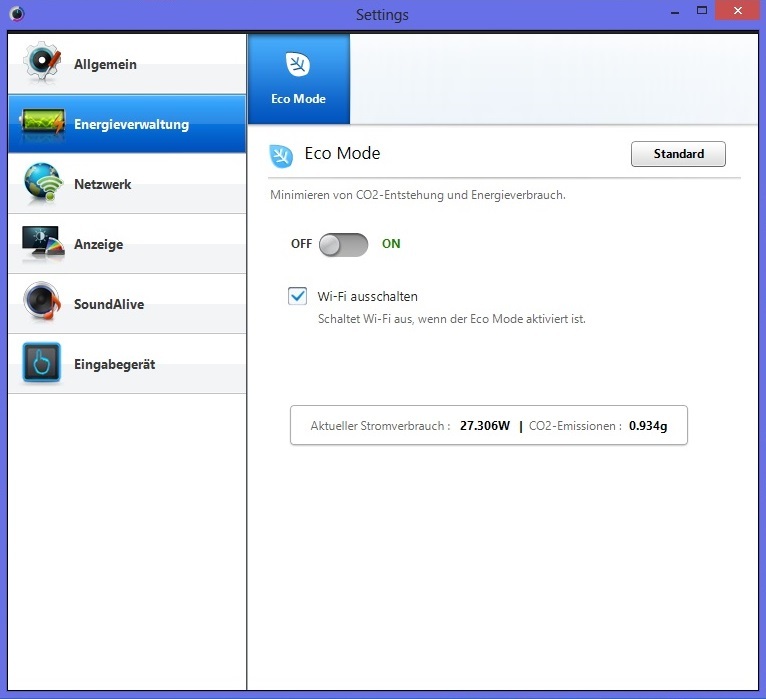 Using this, it is possible to activate the quiet or eco mode, (de-)activating the touchpad and changing other settings for the display and the audio. The delivery package merely includes three information leaflets and the 234 grams AC adapter of 60 W capacity. With a size of 105 x 40 x 30 millimeters, this power supply should fit into almost any pocket. On the subject of power supply, the 43 watt-hour lithium ion battery is unfortunately integrated into the case. This may be annoying to many, but it has been a long time since an OEM has included a recovery DVD with the laptop. At least the operating system can be backed up with the pre-installed "Recovery" tool. 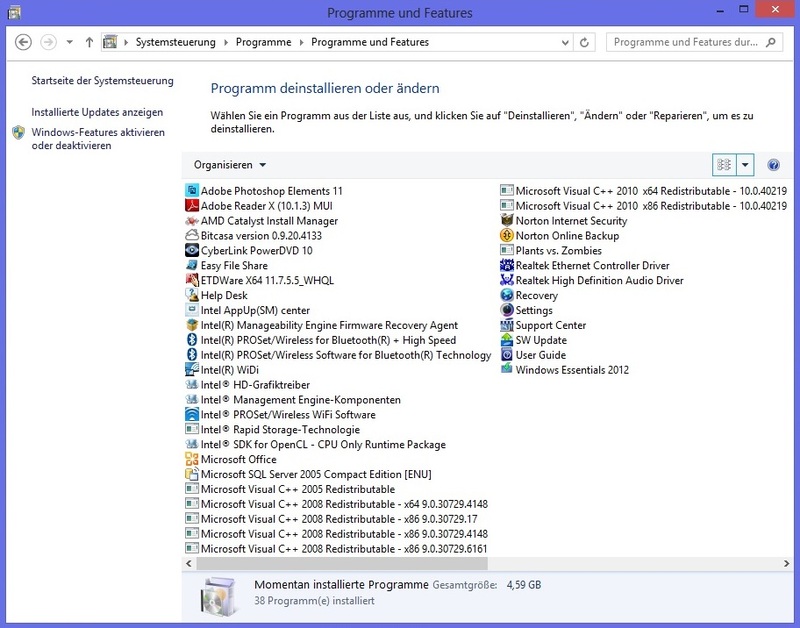 Restoring the operating system is possible directly in Windows 8 or via the hidden recovery partition. The warranty is valid for 24 months. Within the first 90 days from the date of purchase, it is also possible to extend the warranty to three or four years. For demanding graphics processing, a graphics card by AMD has been included. The Radeon HD 8750M is based on the same GCN architecture (Graphics Core Next) as its predecessor the HD 7750M, which is manufactured using the 28 nm process. With 384 unified shaders, the DirectX 11.1 graphics accelerator nestles comfortably in the table of mid-range GPUs. 2048 Megabytes of DDR3 VRAM may look like an ample amount at first, but the memory only has a 128-bit wide interface. Compared to its GDDR5 counterpart which provides faster/larger throughput, the DDR3 version uses a faster clock speed to compensate for the performance losses. 825 MHz (core) and 900 MHz (memory) are clock speeds that are rather high frequencies for such a middle-tier card. Thanks to dynamic graphics switching, the Radeon HD 8750M is only active when its performance is really required. For less demanding applications such as office use, video playback or using a web browser, the HD Graphics 4000 inside the processor is used. Advice: If a 3D application is running suspiciously slow, users should start the Catalyst Control Center (right-click on the desktop) and check which profile is active. 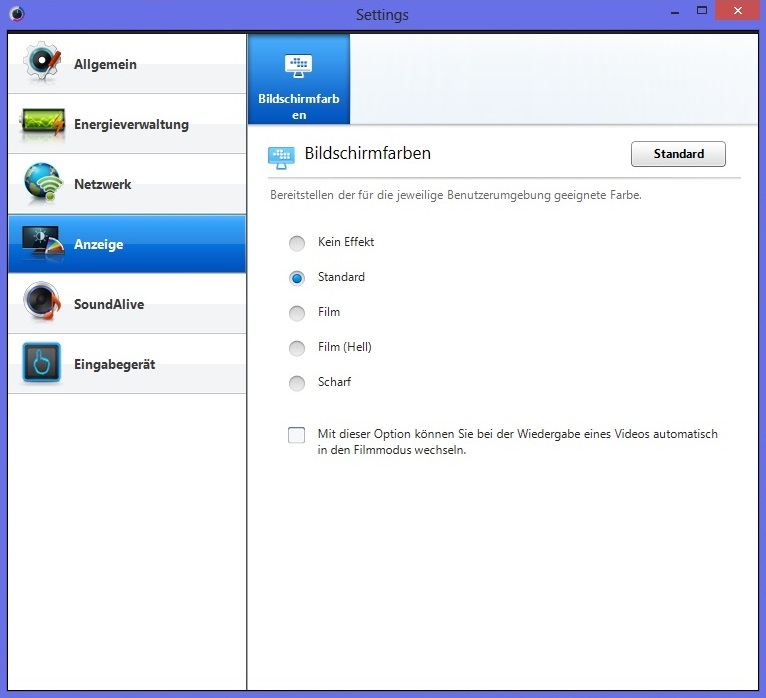 In the menu 'Graphics options - User settings', all the installed and recently opened programs are listed. The "High performance" option represents the Radeon HD 8750M, while "Power saver" on the other hand uses the HD Graphics 4000. 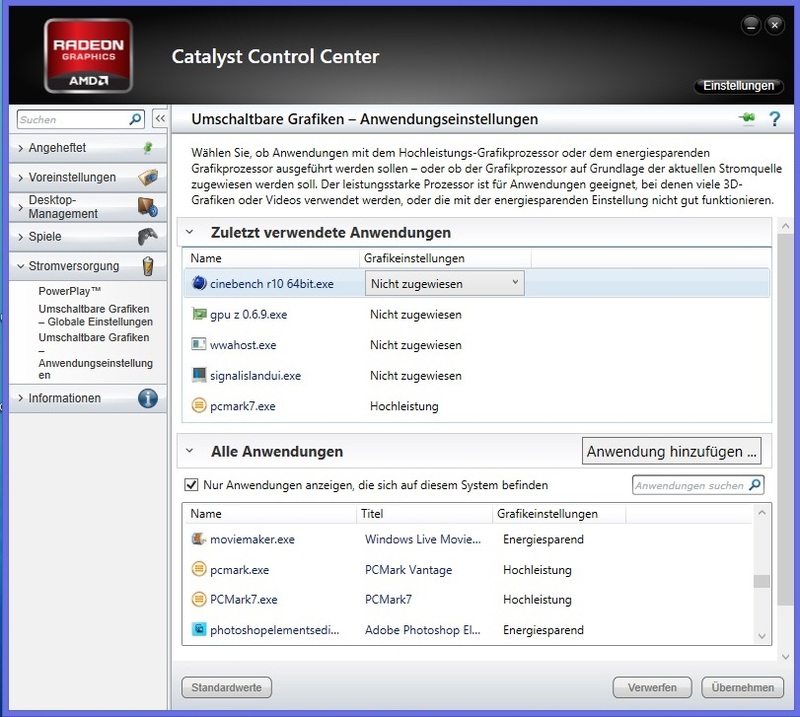 If necessary it is also possible to change the global settings in the Catalyst Control Center. We carried out our speed tests with the pre-installed GPU driver 9.1.1.0, which is already a few months old. When it comes to the synthetic GPU benchmarks, the Radeon HD 8750M is only minimally slower than its main competitor from Nvidia, the GeForce GT 640M. Let's take 3DMark 11 as an example: With a GPU score of 1534 points, the AMD GPU may be substantially faster than the GeForce GT 630M (Fermi architecture, 1019 points @ Samsung 550P5C-T02), but lags behind the GT 640M (Kepler architecture, 1709 points @ Gigabyte U2442N). Compared to the in-house competition in the form of the Radeon HD 8730M (also GCN architecture, 1368 points @ Dell Inspiron 15R-5521), the HD 8750M performs about 10% better. 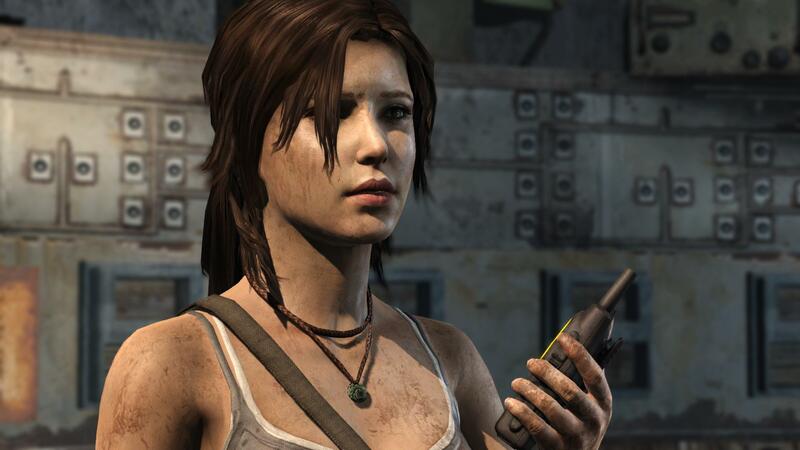 A similar picture emerges when it comes to the Unigine Heaven 2.1 benchmark. At a resolution of 1280 x 1024 pixels and high details with the normal tessellation setting, the Radeion HD 8750M is about 7% faster than HD 8730M(22.6 vs 21.1 fps). And while the GeForce GT 630M doesn't stand the faintest chance at about 16 fps (16.4 fps @ Dell Vostro 3460), the GeForce GT 640M on the other hand takes the lead (23.5 fps @ Acer TravelMate P653). The hard drive is a 9.5 millimeter high HDD with a capacity of 1000 GB. The SpinPoint M8 HN-M101MBB comes directly from Samsung itself, and provides decent performance. 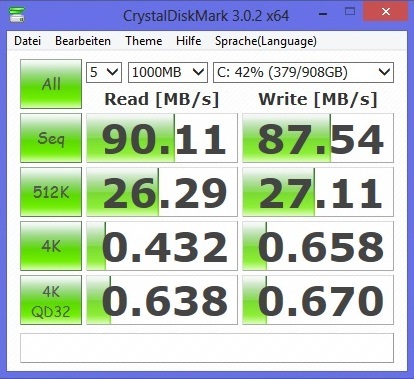 With around 90 MB/s during sequential read and 88 MBytes/s during sequential write (CrystalDiskMark), these are numbers that are not provided by every 5400 rpm hard drive. The access time of 20 ms meanwhile is average for this class of device (HDTune). Inside the 17-inch 770Z7E, the same HDD provided a comparable performance, while Toshiba's MQ01ABD100 in the HP Pavilion g6-2253sg and other notebooks represents one of the fastest 1 TB HDD competitors to the Samsung Spinpoint. Unfortunately, due to the absence of a lightning fast SSD, the system performance isn't able to improve over other notebooks in this price range. With a PCMark Vantage score of 7283 points, the 510R5E nestles in with other multimedia notebooks like the Dell Vostro 3460 and the older HP Pavilion dv6-6008eg (7253 points @ Core i7-2630QM, Radeon HD 6770M, 8 GBytes of RAM & 500 GByte HDD). Our comprehensive gaming test (see table below the Verdict) confirms the impressions we got during the synthetic benchmarks: The Radeon HD 8750M is able to come close to the GeForce GT 640M in terms of performance, but Nvidia's Kepler GPU has a slight lead overall. While less resource intensive games such as Diablo III, Skyrim, Fifa 13, Dishonored or Call of Duty: Modern Warfare 3 can also be played with high details and active anti-aliasing, users will have to make do with medium settings in some cases (e.g. Far Cry 3, Battlefield 3, Guild Wars 2 or Need for Speed: Most Wanted). In most cases, the performance advantage over the Radeon HD 8730M stays within 10%, and occasional gamers that don't have to necessarily play every game with all the bells and whistles are likely to take a liking to the Radeon HD 8750M.